John Carpenter's They Live turns 30 this year, but its social commentary remains as relevant as ever. 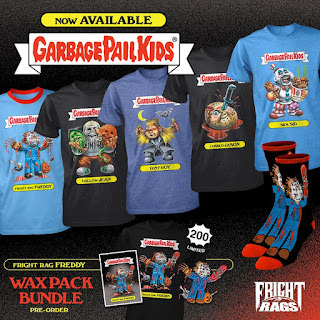 Fright-Rags released a new collection of merchandise dedicated to the cult classic, plus it has turned several horror favorites into Garbage Pail Kids for a new line of shirts. You don't need special sunglasses to see Fright-Rags' They Live collection. Consume five T-shirts, a pair of socks, and two enamel pins - include one that flips open to reveal an alien face behind its human visage. Friday the 13th, The Lost Boys, House of 1000 Corpses, and Halloween III: Season of the Witch have received Garbage Pail Kids makeovers by GPK artist Brent Engstrom. Each design is printed on Fright-Rags' super soft 4.5oz poly/cotton blend shirts. Fright-Rags also has its own Garbage Pail Kids character, Fright Rag Freddy. It's available on a ringer tee, a pair of socks, and in a "wax pack" featuring a T-shirt, enamel pin, and trading card. The wax pack is limited to 200 and moving fast. Obey Fright-Rags and buy They Live and Garbage Pail Kids apparel now at Fright-Rags.com.